So many good song choices for this weekend’s situation that I just couldn’t decide which theme I liked best, so I’m just going to overwhelm you with tunes and let you decide. Just remember that once you click on a song, if you subsequently click on a chart, the tunes will end – bummer, I know. Perhaps it’s best to just read the technicals and come back for the tunes – like the markets, they are interesting to watch! You see, the markets are at a major crossroads, they are rollin’ & could soon be Tumblin’, and if you are a bull, they have got you under major pressure! The truth is that Citi has failed. GE is failing. The auto makers are already gone. People have seen the largest institutions collapse and yet their bank accounts still function and heck, even the store fronts are still there. Last night we drove by a WaMu retail space still in operation. Thus the people are not fully aware of what’s happened or likely to happen as this crisis progresses. Fear is low. Citi is a much larger institution than the ones that have failed to date, yet we don’t call it a failure, we call it, what, partial nationalization? Bank of America is next. Then what, Wells Fargo? What happens when we get to JPMorgan, the world’s largest holder of derivatives? No, there absolutely is legitimate reason to be fearful; fear levels by investors still do not match the underlying math and ramifications for the future. The crossroads that we face as this situation has developed are getting more severe, the choices more difficult. So far, our actions are the exact opposite of those required for a good long term resolution. At each crossroad, the market has voted. It is talking in loud and clear terms. It is saying, “CUT THE CRAP!” Yet evidently no one is listening, no one in power hears. Or do they? And do they have a plan that will be implemented at the height of fear? Is that thinking like a conspiracy theorist, or is that just the fact of how events regarding money systems always unfold? Like the events that led up to the Bretton Woods Agreement in 1944 or to Nixon ending the gold standard in 1971. Each step has resulted in more leverage, lower banking reserves and greater prosperity for the banks. How about the people? Are they really better off? Or does it take two incomes, two full time working people who don’t have time for their children to afford the average home? Oh yeah, that average home is bigger and better, uses more energy and now requires more upkeep… but is the overall life better? Are Americans more creative or less? Are we more free, or less? Are these merely questions to ponder, or points that we’re willing to take action to change? Many technicians are pointing to positive divergences in the Advance/ Decline line and the fact that we are near to completing wave 5 down as a reason that a large rally is coming soon. Some believe that wave 5 down will be followed by wave B up/sideways while others believe that we are still in wave B up/sideways from Last November and about to make wave C up. Everyone is looking up, yet they are forgetting that no two bear markets are the same and wave 5’s can extend a great ways or that wave B doesn’t have to retrace a full 50% as they believe. The markets are going to express the underlying fundamentals over time regardless… the math of debt is in charge, not the Federal Reserve. That’s why I think it’s important at this juncture in the markets to NOT get focused on any particular notion about a bounce or a crash. 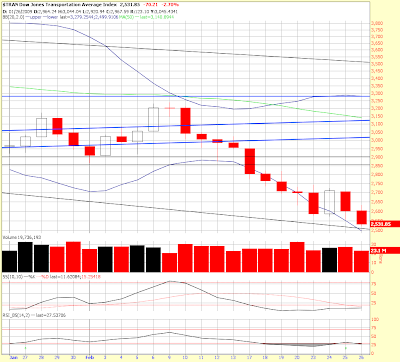 The fact is that we have been and are crashing, look at the monthly charts below! 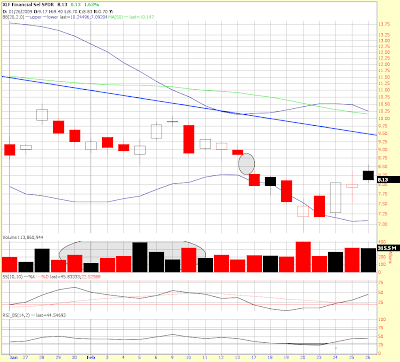 Crash or bounce from these oversold conditions? Either could happen and since it’s a ferocious bear market they can happen quickly and suddenly in either direction, usually doing the exact opposite of what is most expected. 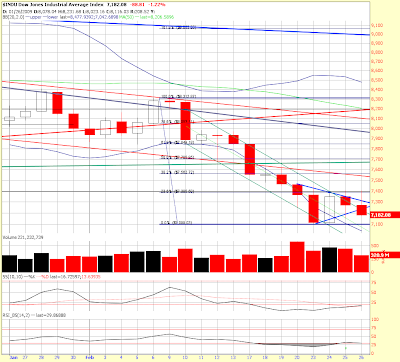 We must continue to use channels and other technical indicators to determine short term direction. The long term direction is still clearly down. 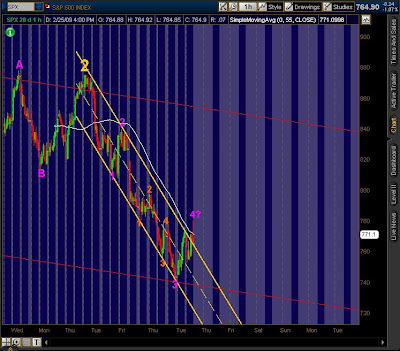 I believe it’s most likely that we’re in wave 5 down, but like I have said, wave 5’s can be any length. They can extend or they can truncate. And the truth is that sometimes the waves are not clear – that’s why we have various Elliott Wave experts at different places. Which one is correct? They will probably be arguing over it for decades. What’s working for me right now is to consider us in wave 3 down of wave 5 down. What’s disturbing is that this wave is beginning to look an awful more like the prior wave 3 down in October/November than the earlier wave 1. If that’s the case, the markets are now rolling and pretty soon they will be tumbling. Friday’s action resulted in the DOW losing 119 points (1.7%), the S&P gave up 2.4%, the NDX lost .9%, and the RUT lost 1% even. 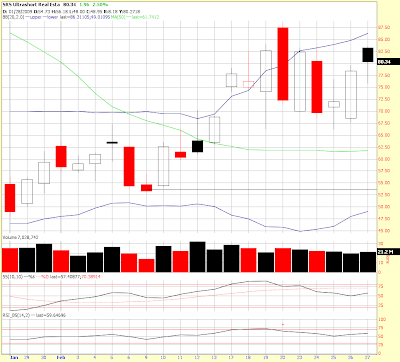 The XLF coughed up 6.5% as Citi gagged on a 39% loss from news that the government was now a 36% owner. Internally, declining issues outnumbered advancing on the NYSE by 2 to 1, and by volume the declining side led with 77% of the volume, while the number of new lows expanded. 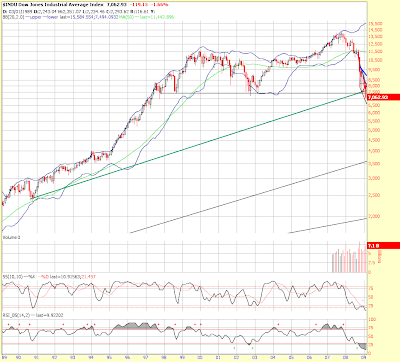 Let’s start by looking at the Advance Decline. A lot of technicians are pointing out that there’s a positive divergence here and that bottoms that last a while usually have these. A positive divergence shows that not all the issues are declining and that the market is being held down by only a small group. So, let’s examine the facts. 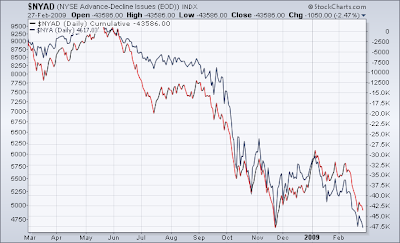 In 2006 there was a HUGE negative divergence that lasted longer than a year and is way larger than any positive divergence now by quite a margin. 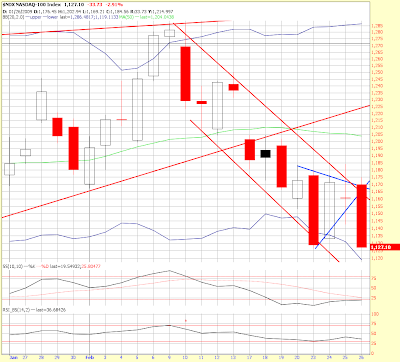 Some technicians say they see this divergence in all the indices. Now, let’s look at the charts. 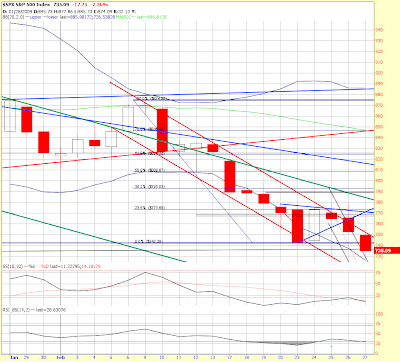 I’ll tell you right up front that all the stochastic indicators are oversold, thus we either bounce or continue to crash. Also, there were several outside hammers that were produced on Friday. 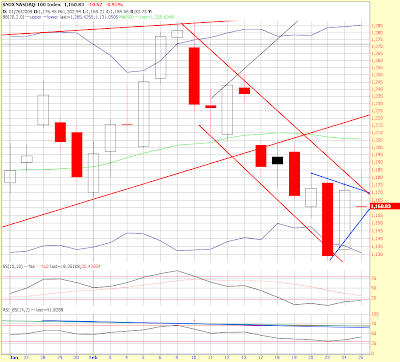 They can indicate reversal, but they must be confirmed by price action rising on Monday. Also, we are in wave 5 of 3 by my count. It could end at any time or it could extend. 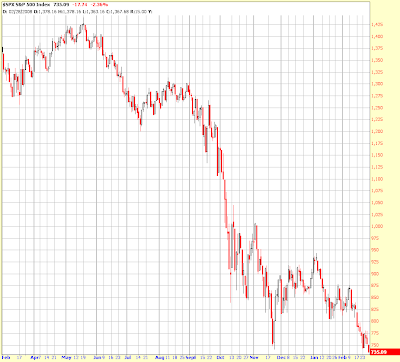 So, take a look at that last chart and tell me that the markets are not crashing. They are. Will we bounce a little in here? Possible, but I’d give the odds of an oversold crash about equal weight, maybe more if I compare what’s happening now to wave 3 down. Then again, I don’t ignore hammers. Thus, I don’t think it’s wise to bet your life savings one way or the other. If you’re going to play in this market, you’ve got to put a little money on the line, but you’ve got to manage your risk very carefully. So, here's a question... why does someone who is telling the truth have to be interviewed on the "Renegade Economist," and not by some "mainstream" media source? Once you answer that honestly, then you will understand the root of the problem. Many of you do, I know... but those who do not, please think it through. Not so sure everything was as good as he states in antiquity, money systems did not last that long then either and went through periods of adjustments, so he is oversimplifying. Not sure I would condone blanket debt cleansing either. Interview is food for thought. Excellent interview. Appreciate your discussion/ thoughts after viewing. Nate's sounding less radical all the time. My take is his answers are only partial solutions - stimulus and bank fixing doesn't address all the debt already created and held by the people - 17 minutes total, well worth it! 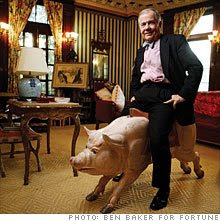 In 1970 a young Wall Streeter named Jim Rogers hooked up with George Soros to start the legendary Quantum Fund. The ensuing decades have seen Rogers build an iconoclastic career as an author, adventurer, and creator of the Rogers International Commodities Index. And throughout, Rogers—now based in Singapore—has remained an outspoken global investor. Today is no different. He has harsh words for former Fed Chairman Alan Greenspan, suggests President Barack Obama and his economic team are not up to the task, and thinks tough love is the answer for America. What do you think of the government's response to the economic crisis? Terrible. They're making it worse. It's pretty embarrassing for President Obama, who doesn't seem to have a clue what's going on—which would make sense from his background. And he has hired people who are part of the problem. [Treasury Secretary Tim] Geithner was head of the New York Fed, which was supposedly in charge of Wall Street and the banks more than anybody else. And as you remember, [Obama's chief economic adviser, Larry] Summers helped bail out Long-Term Capital Management years ago. These are people who think the only solution is to save their friends on Wall Street rather than to save 300 million Americans. Bank of England Governor (central banker), Mervyn King, claims that he was “powerless, so keep that in mind,” and don’t blame him for bank failures! Ha, ha… that’s hilarious. Of course England has NO, as in ZERO, bank reserve requirement. No, he had no control over that, don’t blame him for the banks leveraging up to infinitive heights. Not taking responsibility while asking for taxpayer bailouts is a central banker recurring theme. Yes, they are at the heart of the matter and are to blame. It was his predecessors that met and signed onto the Bretton Woods agreement, and it has been them that profited beyond imagination while permeating the world with debt. It was central bankers who abandoned the concept of usury and it was them who manipulated and called for changes to the bankruptcy laws for the people, effectively preventing them from losing unsecured debt in the bankruptcy process. Yet, now that they are bankrupt, they don’t even want to go to court, they want the very same people who they charge 30% on their credit cards to come in and bail them out. By request, a great song choice for Mr. King. Like Point says, "Yep, just like no one was to blame in 1929, either." This is the worst report in 26 years, and much worse than the “experts” were expecting. Much of the decline was due to exports. What’s been giving us that clue? How about the Transports? 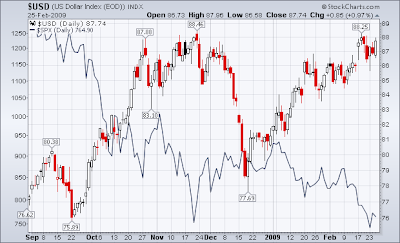 The Baltic Dry and DOW Transport index have been shouting COLLAPSE. Now we’re seeing it. 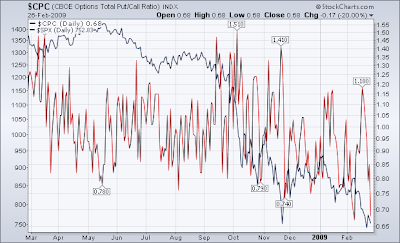 That’s what I have meant by saying the Transports are a leading indicator. A revised reading on fourth-quarter gross domestic product was its worst in 26 years. NEW YORK (CNNMoney.com) -- The nation's economic slide during the last three months of 2008 was even sharper than previously estimated, with the broadest gauge of economic activity suffering its worst decline in 26 years. Gross domestic product, which measures the output of goods and services produced in the United States, fell at an annual rate of 6.2% in the fourth quarter, adjusted for inflation, according to a preliminary report from the Bureau of Economic Analysis. The decline was worse than the 3.8% drop that the BEA reported in last month's "advance" reading on fourth-quarter GDP. It was also the largest drop in GDP since the first quarter of 1982, when the economy suffered a 6.4% decline. Economists had been expecting a 5.4% contraction, according to a survey conducted by Briefing.com. In the third quarter, real GDP decreased 0.5%. The initial estimate for fourth quarter GDP showed the recession is worsening with a sizeable 3.8 percent decline, following a 0.5 percent contraction the prior quarter. The economic decline was spread throughout the economy. The all important consumer spending component dropped 3.5 percent annualized. We also saw sharp declines in residential investment and business investment in equipment & software. Nonresidential structures investment dipped slightly and even exports declined. We likely will see a downward revision to the fourth quarter. But pay specific attention to final sales-which indicate how strong demand is. 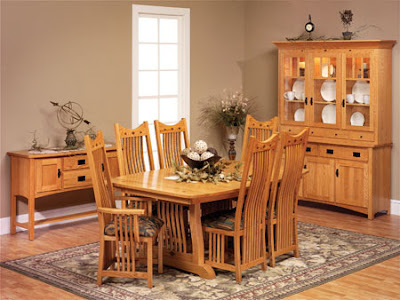 Markets did not pay much attention to it, but final sales fell an annualized 5.1 percent in the fourth quarter. How this figure winds up will play a key role in how first quarter growth ends up. Disastrous GDP report at -6.2%. 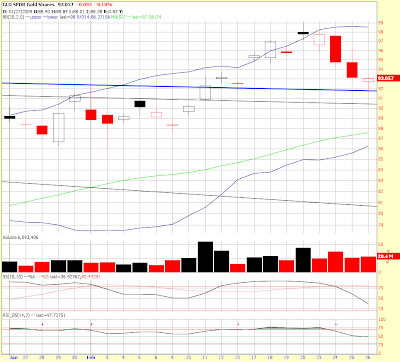 Also the news that Citi will be forced to raise private capital in matching funds is weighing on the financials. One of the points with the Citi deal is that all the preferred stock must be converted into common. All I can say is what’s the point? So much wasted effort and resources, we would be SO much better off letting the system go and starting over. That’s going to happen, mark my words. All the people who are trying to save the current system are simply going to lose. Hey, people didn’t believe me when I said WaMu wouldn’t exist nearly two years before it happened… it happened. How do I know? I know because the math doesn’t work. The math doesn’t work for our nation as a whole, either. Thus major change is coming. 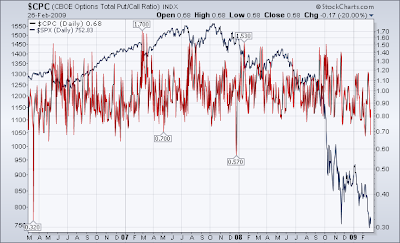 So, we’re going to open below the November lows on the S&P… too much bullishness as indicated by the put/call ratio. All those people were once again on the wrong side of the trade. Meanwhile, the Doc and I have just been drawing channels and counting. 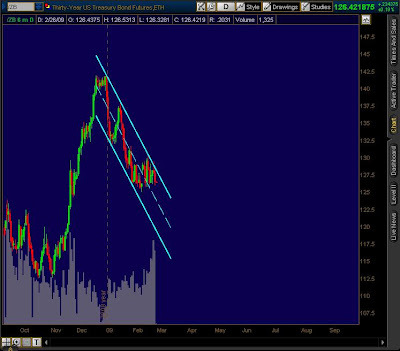 If you look at the chart Doc posted last night, you’ll see that the bottom of the channel is all the way down about the 715 area today. Will we get there? Don’t know about today, but yes. 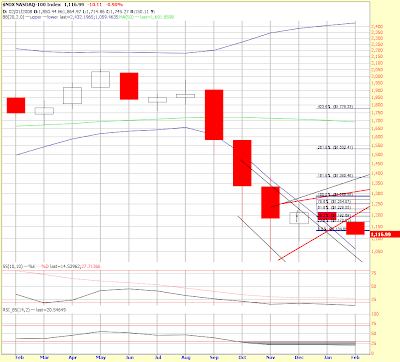 The bulls HOPE that the market doesn’t close below the November low. Doesn’t matter. 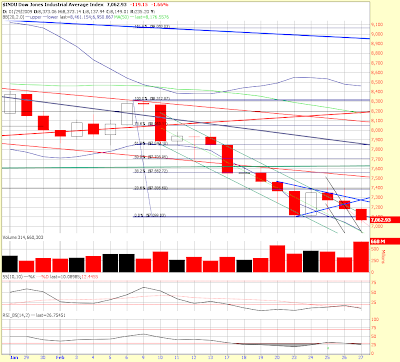 We already have a new closing low and now we have a lower pin low. 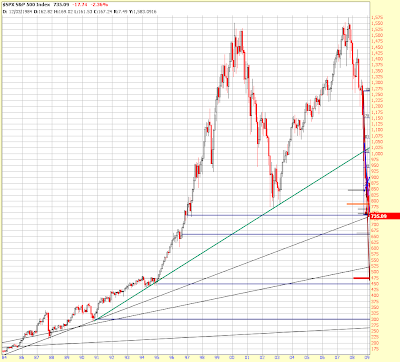 Be cautious, though, as sometimes the markets will rally after a breach of an important support level. 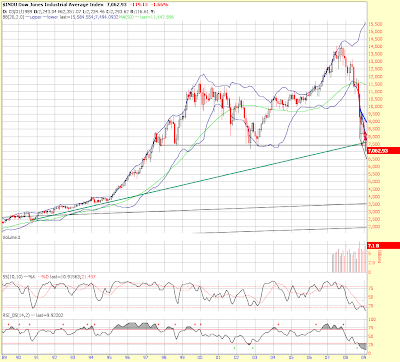 We’re also expecting a larger wave 4 at some point soon, so getting a little protective is probably a good thing. If you’re betting on an all out collapse, you are taking a very big risk. Doesn’t mean it can’t happen, it can. What I do is take profits here, but I’ll keep something short just in case and if I see further technical breakdown, then I’ll jump in and use my entry point as a stop. 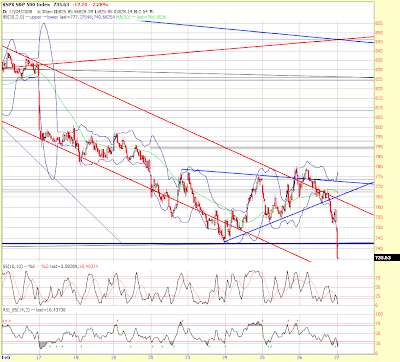 Honestly, there is not a lot of support down here, but a retest of the break is almost guaranteed. 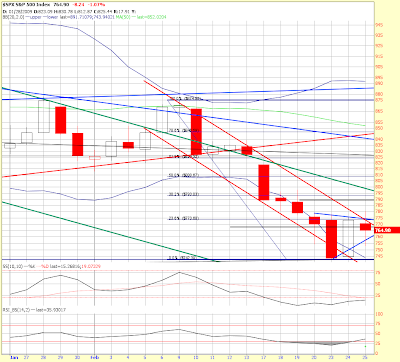 The oscillators are oversold, too. So, the market’s definitely under pressure… the Doc and I are taking profits, but holding some short. DoctorMad Update - Bears back in control, but for how much longer? The General is seeing the battle over wave 3 down of 5 down coming to an end once this subwave is over. He knows that wave 5 can be tricky so he delineates the battlefield on his maps for you. I don’t know about you, but I think it’s a lot easier to navigate with a map. Thanks, Doc! The bears took the short-term initiative back from the bulls with a sell off into the close that broke the wave 4 momentum. By all indications this is now wave 5 and wave 5’s can truncate at any point which means you have to be on your toes and be ready to issue a full retreat if the bulls start to mount an offensive and bring the heavy ammo (volume). The next retrace impulse is likely to be the start of a larger degree retrace wave 4 and I'd expect the bulls to make a strong run at re-testing the 800 trench on that move. Bonds continue to drift lower even in the face of lower stock prices. It's imperative that the bond bears take out 125 or the bulls may have a double bottom to work with and we might get a flight into bonds for a few days. 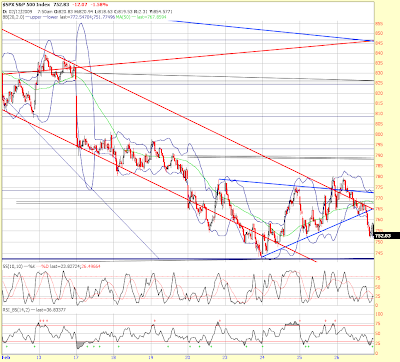 As long as the primary channel holds I'm going to continue to look to short bonds playing the spikes. The bears might have turned almost 30 years of bullish momentum in bonds back on Dec 30th of last year and shorting the long bond will be a good trade to have on this year...at least until the primary channel breaks. I soon as I saw that phrase, “bears back in control,” I got Thin Lizzy going in my head. Just substitute the word BEAR for Boys and sing along! Right from the beginning of the day the bad economic news rolled out, one thing after the other – none of it good. How can it be otherwise with the math the way it is? 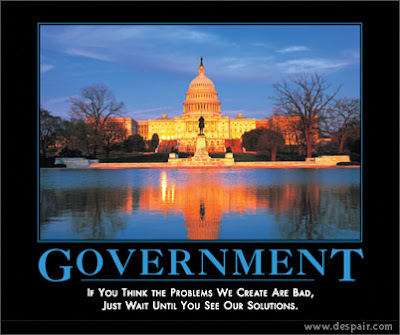 Government intervention is not only too little too late, it’s at the root of the problem. It would also seen that the love affair with Obama is coming to an end as people begin to see that his budget is huge compared to his income and that he has already established a reputation of over promise and under deliver. Internals were only 8 to 7 negative on the NYSE but 8 to 5 on the Nasdaq. Volume was about the same relationship but there were ZERO new highs today on both. If you’re following the daily market thread, you would have seen that I posted those charts just before this last decline really got going. It’s a team sport, whenever you see extreme readings, let us know! On the bullish end of the sentiment spectrum the VIX fell low enough earlier in the day to trigger a bearish target on the P&F charts. 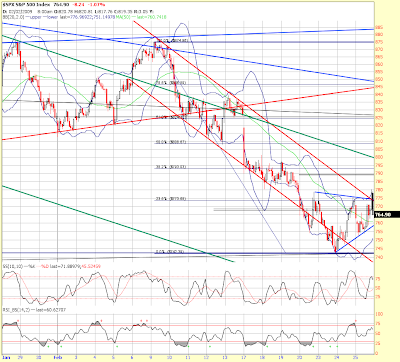 I’m discounting that target unless I see us break that level again as it barely broke support and came right back up. 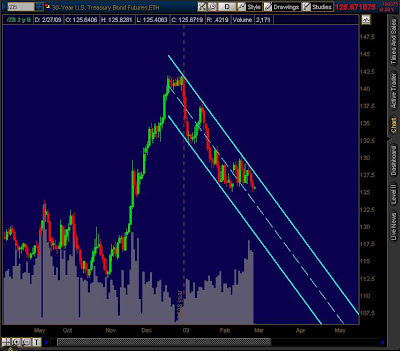 If it breaks that level again then I believe it. 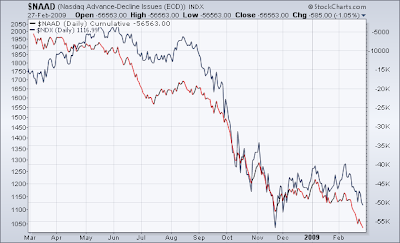 Again, I do not believe that’s a true inverted hammer on the DOW as the DIA is not anything like it. Hate to waste a good song title, but couldn’t resist. Click “interesting” if you really have no idea what that EW count I described means! Obama is claiming that he is cutting taxes… but as the article below shows, he is shifting taxes to the wealthy. That is, after all, all the government can do! They cannot produce or add to the nation’s productivity. All a government does is SUBTRACT from productivity and rearrange the chairs. 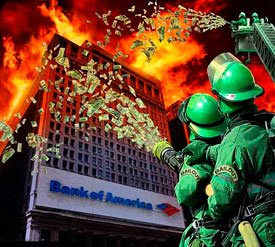 Setting aside $750 billion ($250 billion MORE) for the banks? That's a nice assumption - if you're a banker. His new budget is making some assumptions that I just don’t believe match reality. He is claiming an economic growth rate above 3% for next year? HUH, really? Exponential growth is what is behind us. What lies ahead is not growth. I think Obama will find that his assumptions will not even be close. Falling revenues and increased expenses will only add to the math that simply doesn’t work. He sounds great talking about acknowledging budget realities, and yet, he is NOT adhering to them. Yes, moving wars into the budget is more real, but what about obligations to Medicare, Social Security, the FDIC, on and on? How about bringing military and defense budgets out into the open? The White House said this morning to expect $9 trillion in deficits in the next decade. I say that’s not even close. How are we going to finance all that debt? His budget for this year forecasts a $1.75 trillion deficit - this year! Last year our nation’s TOTAL INCOME was only $2.7 trillion. If our deficit (non-GAAP) is $1.75 trillion, that only leaves $.95 trillion to meet all the current needs of government. That deficit is 65% of income!! How is that going to work? Here’s a hint, IT’S NOT GOING TO WORK. Revenues are falling and will continue to fall for the government. 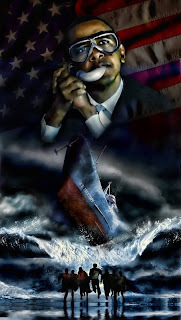 America is about to learn a huge lesson in too much debt, too much military, and too much government. All will come down and it will be painful – get ready. Spending and tax outline proposes dramatic health care overhaul - vows to slash deficit, projected at $1.75 trillion in '09. NEW YORK (CNNMoney.com) -- President Obama on Thursday pulled back the curtain on his first detailed vision of the federal budget for the next 10 years. His outline includes an ambitious plan to reform health care, half of which would be paid for by increasing the tax bite on high-income Americans. Obama has said repeatedly that his first fiscal plan would have a two-pronged mission: to reduce the $1 trillion-plus deficit and make big investments in the future. The administration estimates that the deficit for fiscal year 2009 will reach $1.75 trillion, or 12.3% of U.S. gross domestic product. That's a record in dollar terms and is the highest as a share of GDP since World War II. 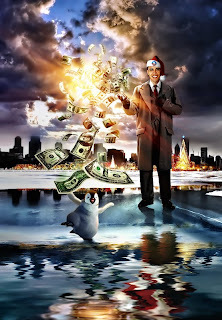 Obama's promise: reduce the deficit he inherited to $533 billion by 2013. "We will each and every one of us have to compromise on certain things we care about, but which we simply cannot afford right now. That's a sacrifice we're going to have to make," Obama said. "What I won't do is sacrifice investments that will make America stronger, more competitive and more prosperous in the 21st century," he said. Obama's outline also reveals how much more money he and his economic team are setting aside to stabilize the financial system. Their estimate: $250 billion. That would be on top of the $700 billion already authorized by Congress under the Troubled Asset Relief Program. The document the White House delivered to Congress on Thursday is only a broad-stroke preview of the president's formal 2010 fiscal budget request, which is expected out in April. Lawmakers will spend the next several months debating and amending final legislation. Create a $634 billion health care reserve fund: The purpose of the fund would be "dedicated [to] financing reforms to our health care system," according to the budget outline. Among the fund's goals would be to aim for universality of coverage and reduce the growth in insurance premiums. It would be paid for in two ways. The first, expected to raise $318 billion over 10 years, would limit how much of a deduction high-income taxpayers may take. Instead of reducing their tax liability by their top income tax rate, they wouldn't be allowed to reduce their bill by any more than 28%. So for every $100 in deductions, they would reduce their tax liability by $28. The second way Obama proposes to pay for the fund is to achieve health care savings by, among other things, reducing payments to private insurance companies offering Medicare and reducing prescription drug prices. The administration estimates these efforts could save $316 billion over 10 years. The budget outline also notes the $634 billion fund is "not sufficient to fully fund comprehensive reform" but is a first step in the process. Let tax cuts expire for families making more than $250,000: The president's budget would allow the 2001 and 2003 tax cuts to expire for high income tax filers to help reduce the deficit. The White House estimates doing so could raise $640 billion over 10 years, although Obama's desire to extend those same cuts for lower and middle income families is estimated to increase the deficit by more than $900 billion during the same period. Commits more money for renewable energy efforts: Obama's budget will call on Congress to create a cap-and-trade program in which companies would have to pay for permission to emit greenhouse gases. Revenue from the program is intended to pay for a $150 billion renewable energy fund among other things. Budgeting is always about assumptions. Government are the very worst at forecasting… as more details come out, pay attention to assumptions, follow the flow of money – it is shifting from one group to another (mainly from everyone else to the banks, but also from the wealthy to the poor). Feb. 26 (Bloomberg) -- President Barack Obama proposed almost $1 trillion in higher taxes on the 2.6 million highest- earning Americans, Wall Street financiers, U.S.-based multinational corporations, and oil companies, to pay for permanent breaks for lower earners. The president’s 2010 budget proposal, released today, would reinstate the top two Clinton-era tax rates of 36 percent and 39.6 percent in 2011, up from the 33 percent and 35 percent that the wealthiest Americans currently pay. It would also raise taxes on capital gains and dividends to 20 percent for top earners, up from the 15 percent established by former President George W. Bush in 2003. The tax increases, which Obama vowed to implement as a presidential candidate, would be the first on high-income earners since 1993 and would reverse a course set by Bush of lowering the tax burden on the nation’s wealthiest people. Obama’s budget does keep in place Bush’s tax cuts that benefit lower- and middle-income earners and it preserves a sliver of policy that benefits the more affluent: A preferential tax rate on corporate dividends. Before Bush, dividends were taxed as ordinary income, or at rates as high as 39.6 percent in the 1990s. Higher-income earners, primarily families with more than $250,000 of income, would face an additional tax burden under a proposal to reinstate limitations on their itemized deductions, which would subject more of their income to tax. In all, top- earning households would pay $636.7 billion in additional taxes over the next decade, Obama’s budget estimates. The higher taxes on individuals will largely be used to pay for expanded health coverage for lower-income Americans and to make permanent Obama’s tax breaks such as a payroll tax credit worth up to $1,000 that was adopted on a temporary basis in the $787 billion fiscal stimulus measure earlier this month. Executives at private-equity firms, venture-capital firms, some hedge funds and other partnerships that receive a 20 percent “carried interest” in the firm’s profits would see their tax burdens nearly triple under Obama’s budget. Most of their carried interest currently is taxed at the 15 percent rate for long-term capital gains. Obama is asking Congress to tax the profit share as ordinary income, arguing that it’s a form of wages; under his plan, most executives would pay 39.6 percent. That proposal will likely reignite a debate that was waged by Congress in 2007 when the House of Representatives approved the change and the Senate never considered it. Obama proposed $353.5 billion in higher taxes on corporations over the next decade, the bulk of which would come from “reforming” rules that allow U.S.-based multinational corporations such as General Electric Co. to defer U.S. tax on profits they earn overseas. GE has about $75 billion offshore on which it has never paid U.S., according to its regulatory filings. Obama’s budget estimates such reforms and beefing up Internal Revenue Service enforcement of international tax rules would generate $210 billion in additional revenue over the next decade. He also proposed ending a tax accounting technique called “last-in, first out” or LIFO, that primarily benefits oil and gas companies but is widely used across industries. In addition to oil companies, the repeal of LIFO would hit retailers, automakers and makers of non-automotive heavy equipment, textile makers, consumer products, drug companies, alcohol and tobacco manufacturers and wholesalers, according to tax experts. The accounting method has been commonly used since the 1930s and is viewed as the most accurate measure of income for financial statement purposes, according to the congressional Joint Committee on Taxation, a nonpartisan panel. This is the lowest print ever recorded. 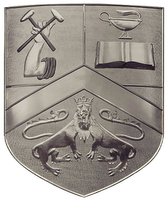 Record keeping began in 1963. What’s shocking to me, even more so than on existing home sales, is the inventory numbers. Even though permits are falling and new starts are plunging, inventories are BUILDING in terms of months supply available – it came in at 13.3 months! Feb. 26 (Bloomberg) -- Sales of new homes in the U.S. plunged in January to a record low as soaring unemployment and mounting foreclosures drove buyers away. Purchases dropped 10 percent to an annual pace of 309,000, the lowest level since data began in 1963, the Commerce Department said today in Washington. The median price decreased 13.5 percent, the most in almost four decades. Even as they slash prices, builders are likely to keep losing customers as foreclosures drive down the value of existing homes further, making them comparatively more affordable. The Obama administration is making a priority of keeping more Americans in their homes to stem the collapse in property values at the root of the credit crisis. “There is a risk that you continue to see foreclosures and you continue to have new inventory added to the market that prolongs the adjustment process,” Zach Pandl, an economist at Nomura Securities International Inc. in New York, said before the report. Housing and Urban Development Secretary Shaun Donovan said today 6 million families in the U.S. may face foreclosure if policy makers don’t act faster to stem the housing decline. Stocks rose, recouping yesterday’s losses, after President Barack Obama’s budget proposed as much as $750 billion in new aid for the financial industry. The Standard & Poor’s 500 Index rose 1 percent to 772.32 as of 10:15 a.m. in New York. Economists had forecast new-home sales would fall to a 324,000 pace last month from a previously reported 331,000, according to the median of 73 projections in a Bloomberg News survey. Estimates ranged from 291,000 to 350,000. Orders for long-lasting goods fell in January for a record sixth consecutive month, and the number of Americans claiming jobless benefits last week jumped to the highest level since 1982, other reports today showed. Bookings for durable goods dropped 5.2 percent, more than twice as much as projected, figures from the Commerce Department showed. The number of initial claims for unemployment insurance jumped to 667,000, and a record 5.1 million out-of-work people were receiving benefits, the Labor Department said. The median price of a new home decreased to $201,100, the lowest level since December 2003. Sales of new homes were down 48 percent from January 2008. Durable goods also dropped TWICE that expected. People getting ahead of this data looking for a trend change are just early in my opinion – way early. Feb. 26 (Bloomberg) -- First-time claims for U.S. unemployment benefits unexpectedly rose last week and total benefit rolls soared to a record high, a sign companies may keep shedding jobs as the recession worsens. First-time unemployment applications increased by 36,000 to 667,000, the highest since 1982, in the week that ended on Feb. 21 from a revised 631,000 the prior week, the Labor Department said today in Washington. The number of people staying on benefit rolls rose in the previous week by 114,000 to 5.112 million. Job losses are crippling the consumer spending that makes up about 70 percent of the economy, threatening to prolong what may be the worst recession in the postwar era. President Barack Obama is counting on his $787 billion stimulus to help stop the slide by creating 3.5 million jobs, and on a separate plan to keep Americans struggling with mortgage costs from losing their homes. February payroll figures, due from Labor next week, may show job cuts exceeded half a million for a fourth consecutive month, according to a Bloomberg survey. The unemployment rate probably climbed to 7.9 percent, the highest level since 1984. Already, the 3.6 million jobs lost since the U.S. recession began in December 2007 mark the biggest employment slump of any economic contraction in the postwar period. Another report today showed orders for U.S. durable goods fell for a record sixth consecutive month in January. The 5.2 percent drop was more than twice as large as projected and followed a 4.6 percent drop the prior month, the Commerce Department said in Washington. Comparable data began in 1992. Excluding transportation equipment, orders fell 2.5 percent. First-time jobless claims were estimated to have fallen to 625,000 from the 627,000 initially reported for the prior week, according to the median projection of 40 economists in a Bloomberg News survey. Estimates ranged from 600,000 to 700,000. The four-week moving average of initial claims, a less volatile measure, rose to 639,000 from 620,000, today’s report showed. The number of people staying on benefit rolls rose more than expected. The unemployment rate among people eligible for benefits, which tends to track the jobless rate, increased to 3.8 percent, the highest since 1983, from 3.7 percent in the week ended Feb. 14. Six states and territories reported an increase in new claims for that same period, while 47 reported a decrease. Futures are up this morning, bonds are down. AIG is reportedly working on a plan that would break the company up and to sell assets, but evidently that plan is running into problems this morning. Still, the stock rose a lot in percentage terms last night. At this point I would have to assume that any attempt to do break the company up would be yet another company playing the shell game to hide good assets in one company and to push the crap off to be abandoned later. The shell game is completely illegal and yet our government has not stepped in to stop the nonsense at all, and in fact have been promoting and sponsoring it. This type of activity is reprehensible; it deprives creditors and employees from getting to the good assets for any type of recourse. This is why we have bankruptcy laws so that supposedly an adult can get in and distribute what’s left. Frankly, this should make Americans furious as we have pumped billions into AIG. Is there anyone looking after our interests? If so, they better get on it. • Jobless claims jump to 26 year high, continuing claims rise to another record, first time ever above 5 million. 667,000 filed last week, economists were predicting a drop to 625,000. • GM lost 9.6 billion unbelievable dollars in the 4th quarter… did I mention unbelievable? • Obama’s budget sees $1.75 trillion deficit for this year. Not that I like the GDP number, but it’s 12.3%. Here’s a better comparison… Total tax receipts last year totaled $2.7 trillion… that puts the $1.75 trillion at 65% of income!! And that’s non-GAAP accounting, not including future liabilities! Oh, there’s $750 billion in there to help the banks… who wrote that budget? A banker? YES! Who do you think is giving Obama all this wonderful economic advice? WAKE UP AMERICA! • Oh, Citi is close to announcing a deal w/.gov… again. I can’t wait. It’s not nationalizing. Oh yeah, we’ll MAKE money on that deal. • Durable goods orders dropped 5.2%, twice as much as expected. This was the sixth consecutive month of declines. New home sales data comes out soon. 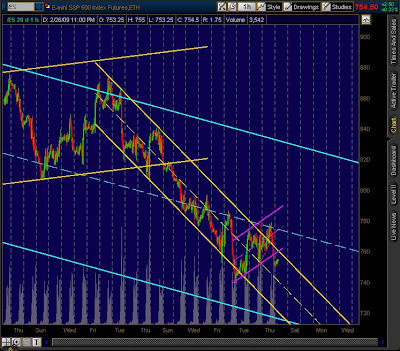 Right now I show us on the edge of the triangle, just beneath yesterday’s high, and just outside of the down channel. 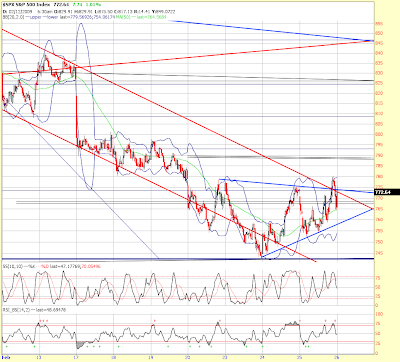 I will respect a break of the triangle as it would be the second time if it occurs. There was a small change in the McClelland Oscillator yesterday which means a large movement in price should come today or tomorrow, direction not indicated by that reading. The stochastic oscillators are near overbought on the 30 and 60 minute timeframes providing room to move higher, but there’s much more room lower. DoctorMad Update – Hard to scare a General! He may be tough, but he knows how to look after his troops and certainly doesn’t want casualties on the battlefield. This General knows where the trenchlines are and doesn’t hesitate to call a retreat once an important line is crossed. That’s trading smart and by the rules of the casino… errr, I mean war. Did the bulls scare you? Well they scared me, just a little though, and by the close not much at all. 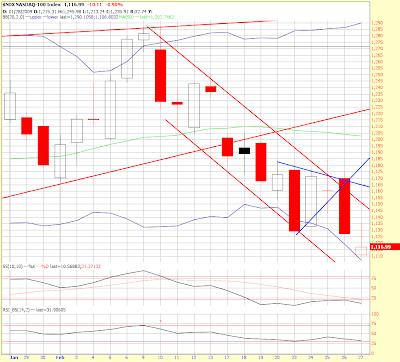 The bulls broke the wave 3 channel on the SPX convincingly at the beginning of the closing hour. However, they got slammed back just about inside the channel by the time the bell rang as Obama gave yet more rhetoric and no meat right into the close. On the ES futures we are clearly back inside the channel as we head into the overnight and by all indications this still looks to be wave 4 of 3. Despite all of the heavy volume whipsaw action today we remain basically in the same position as last night with the bears still (barely) in control of the wave 3 channel. The key lines on the medium and longer term remain for the bulls to defend SPX 741 and for the bears to hold the 800 trench that gave them so much trouble on the way back down to the lows. Any more up action and I issue a retreat and fall back to the 800 line before redeploying short troops. 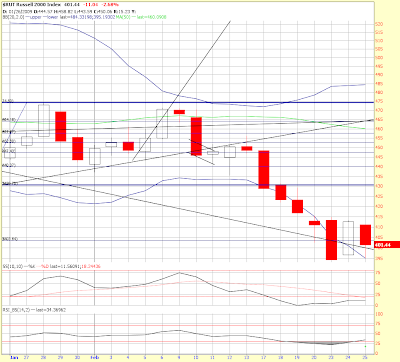 The easy trade of the day was to remain short bonds. We traded down strongly all day no matter what was going on in equities and closed just a point above new lows for this down move. We now have a little more breathing room from the top of the channel which remains my stop out. I found both pieces of Ron Paul's testimony. His first two minutes NAILED IT. He is the ONLY one speaking the TRUTH. Watch the reaction at the end... sad and disgusting. No one wants to hear it and all the other Senators are showing their allegiance to the bankers. He is 100% correct! Boy, did today leave you dazed and confused? 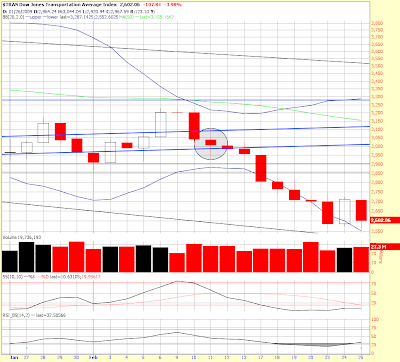 You’re not alone as I can tell by all the dojis that were produced today. I would have been happier ending the day with a positive close and a nice hammer, but instead we got the big indecision doji candle – a mixed picture to be sure. On the day the DOW closed down 80 points, the S&P closed down 1.1%, the NDX finished down .9%, and the RUT gave up 2.7%. 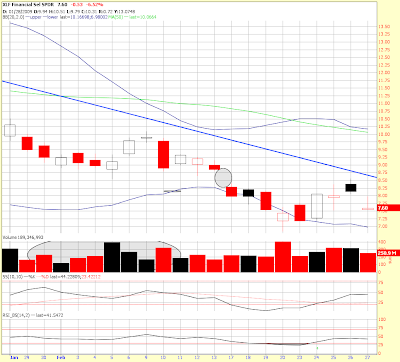 FSLR was notable, losing 22% on the day. 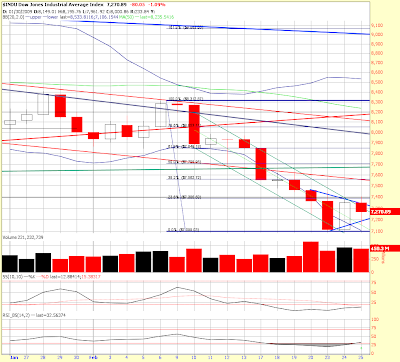 Oil finished higher and gold was down sharply again. 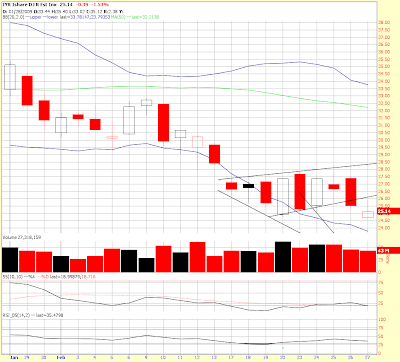 Internals showed declining issues over advancers by a 3 to 2 margin and the volume was just about 2 to 1 negative. 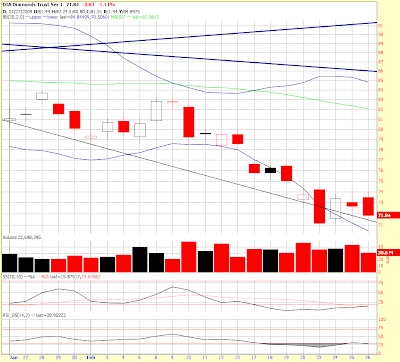 Diverging against prices, however, was the number of new lows which rose today over yesterday. 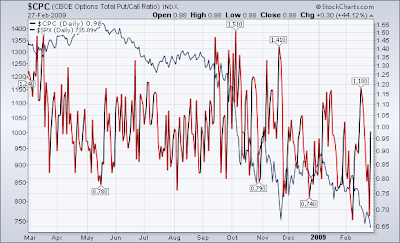 The put/call ratio bottomed at .79 and finished slightly higher at .85. 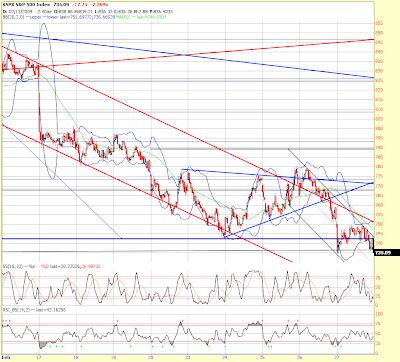 Overall we remain in the down channels and look to have produced a triangle for wave 4 of 3 down. Yes, that count could be wrong, but I don’t think so. 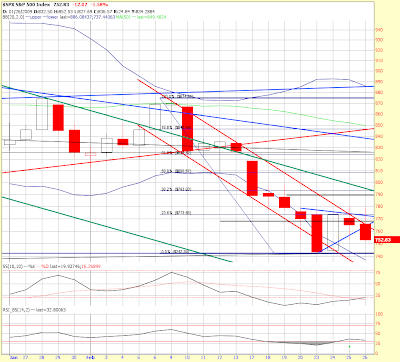 We should get resolution soon and a break above that triangle a second time would be something I respect. 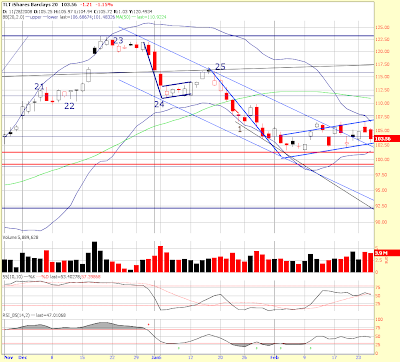 Doc has a great wave 4 saying that I like, “placing money on it should feel painful!” Ouch. Guess that crystal ball is a little foggy, I was looking for a hammer and got a doji – Hey, it can’t be me, the market’s still dazed and confused! Stress Test = Central Banker B.S.